Monemvasia is a Medieval rock-island fortress located in the Laconia region of the Peloponnese. It is connected to the mainland by a causeway, the single approach (moni emvasis). Nearing the fortress town along the causeway, you will see the entrance gate and then the walls that lead upwards to the fortified summit of the rock. Passing through the dark arched entrance, you walk along narrow streets that take you through the Lower Town. The town was first laid out in the 6th Century AD when many inhabitants of Laconia sought refuge from Slav and Arab raiders. During the Byzantine period, the town prospered and developed into an important trading centre. Later, the Venetians and Ottomans occupied the fortress town for almost 400 years until the army of Tzannetakis Grigorakis liberated Monemvasia on 23rd July 1821, during the Greek War of Independence. The many visitors to Monemvasia today usually leave their cars either on the mainland and walk across the causeway, or drive across and hope to find a parking spot on the coastal road leading up towards the town. There is only one entrance into the town from the road, through the Medieval arched gateway, which means only people or donkies can go any further. Once through the gate, there is a narrow street that leads up to the main square (photo above) of the Lower Town. Along this main street there are numerous souvenir, gift and craft shops, cafes, tavernas and bars that mix with small hotels and guest houses. Around the main square there are cafes next to the bell-tower, churches and the town museum. If you continue further, you will meander through various Byzantine and Venetian buildings and churches, some restored, and eventually reach the far walls of the Lower Town. For the more adventurous and energetic among you, the 20 minute climb up to the Upper Town is a must. The steep pathway from the centre square of the Lower Town zig-zags up towards the 2 fortified gateways that bring you out into the Upper Town. Apart from the recently restored 12th Century church of Aghia Sophia at the very peak, most of the Upper Town is in ruins, but from the summit, the panoramic views are absolutely fabulous. Exploring the whole Upper Town may take you back in time and excite your imagination, as on-going excavations are still bringing new exhibits back from the past. On the summit there were ancient temples, Byzantine, Venetian and Ottoman buildings, both religious and military, to house the occupying governors and their garrisons. 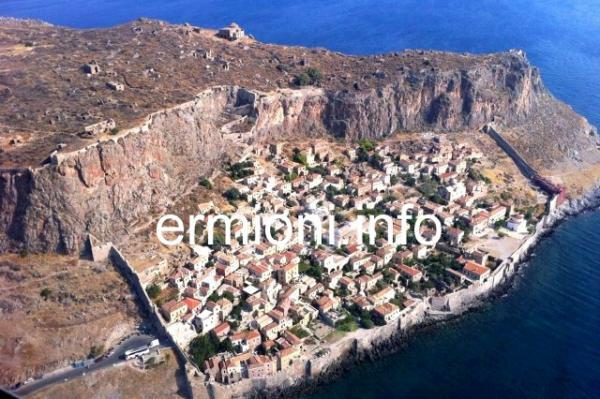 After the Greeks liberated Monemvasia in 1821, the Upper Town depopulated and now is an archaeological site. Access to the Upper Town only until 14:00 hrs. Admission: Free. 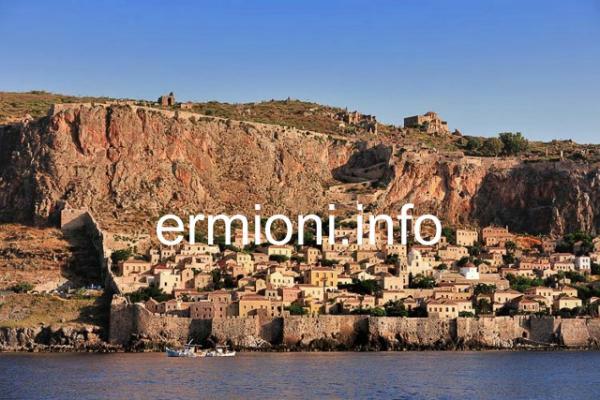 Monemvasia has recently seen a resurgence in importance with increased numbers of tourists visiting the picturesque site. Many of the Medieval buildings within the fortified town have been restored and renovated, with many being converted into hotels, cafes and bars. Recently the town has started to celebrate its Independence Day on 23rd July, where the story of Tzannetakis Grigorakis and his men liberating Monemvasia from the Ottoman Turks is re-told in Greek and English. In the evening, visitors can join the local residents and tourists to watch a warship, filled with pyrotechnics, set on fire in the bay.